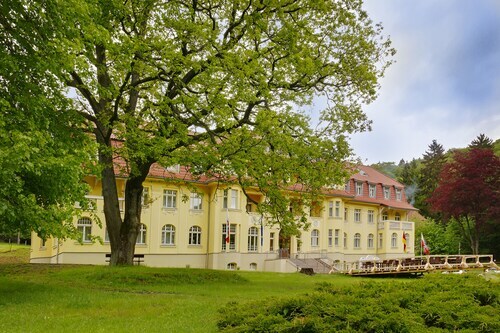 Situated on a lake, this spa hotel is 0.1 mi (0.1 km) from South Harz Nature Park and 6.3 mi (10.2 km) from Walkenried Abbey. Grenzlandschaft and Museum Sorge and Wurmberg Gondola are also within 20 mi (32 km). Situated in a rural location, this property is 1.5 mi (2.4 km) from South Harz Nature Park and 2.3 mi (3.7 km) from Walkenried Abbey. Grenzlandschaft and Museum Sorge and Wurmberg Gondola are also within 16 mi (25 km). Ellrich Station is 15 minutes by foot. How Much is a Hotel Room in Ellrich? Hotels in Ellrich start at $61 per night. Prices and availability subject to change. Additional terms may apply. If you're trekking through Harz and want to spend time in Ellrich, as a well-read traveler, you would be wise to book in advance through Travelocity to make sure you end up with the ideal place to kick up your feet. 4 hotels and apartments listed on Travelocity are within 6 miles (10 kilometers). The Ferien Hotel Südharz is a great base for your stay as it is one of the most ideally positioned Travelocity-listed accommodation options, one of only a small number of places within a comfortable stroll of the Ellrich town center. 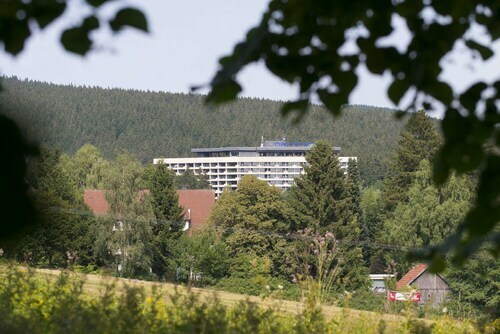 The Ringhotel Weißer Hirsch is about 17 miles (27 kilometers) outside of the town center of Ellrich. An alternative place to stay is the Landhaus Zu den Rothen Forellen, which can be found about 19 miles (30 kilometers) away. 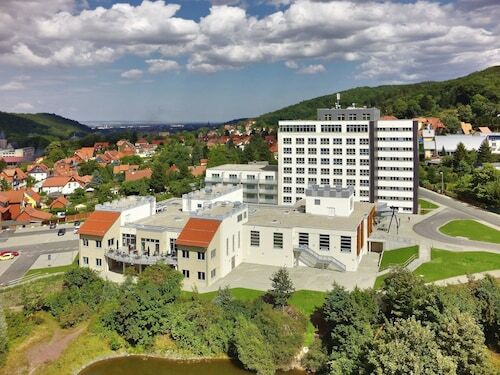 Two other Travelocity-listed alternatives worth checking out include the Travel Charme Gothisches Haus and the Maritim Berghotel Braunlage. If time is on your side, why not investigate the myriad attractions to be found in Saxony-Anhalt while you're in this region? View Saxony-Anhalt's forests, rivers, streams and lakes. You could also wind your way through some of the region's castles and old towns. Visitors and locals alike in this area of Germany will enjoy snowboarding. 25 miles (40 kilometers) to the northwest of Ellrich, you can reach Goslar, which is home to Goslar Imperial Palace and Mines of Rammelsberg. The Altstadt Hotel Gosequell and RAMADA Hotel Baeren Goslar are just some examples of the great hotel options in Goslar. 6 miles (10 kilometers) to the north of Ellrich, you can find Sorge, which boasts the Hotel Tannenpark and Landhausferienwohnungen Am Brockenblick. When you stay in Sorge, make sure you venture to the Grenzlandschaft and Museum Sorge and Ring der Erinnerung. Ensure you get your serving of local sport by taking a journey to Volkswagen Arena, which can be found 60 miles (93 kilometers) to the north of Ellrich. Those sports fans that need to find a bed near to the sporting action should choose between the The Ritz-Carlton, Wolfsburg or the TRYP Wolfsburg Hotel. Erfurt Airport is a practical airport for flying into Ellrich. It's located 45 miles (71 kilometers) from downtown. For modern travelers who choose to find a room nearby, look into Airport Hotel Erfurt or Hotel & Restaurant Park-Cafe ISA.